Every winter I curse the cold weather. I am the type of person that would rather be drenched in sweat in 100°F+ temps than in any weather below freezing. The cold, however, does provide a few positives that I can use to my advantage: Colder tap water for chilling and about 59°F basement temp. The latter allows me to not stress my fermentation chamber as there is a lower temperature differential while brewing lagers in the low 50°Fs. At the end of October on a trip to the homebrew store I was picking up some ingredients and persued the "Recently Expired Yeast Selection." The bargain bin of yeast (well 'bargain' is the homebrew store's term since these vials are still $5 at this store) contained WLP940 Mexican Lager Yeast. I had heard great things about this lager yeast. In particular it results in quick fermentation times. Perfect! I have always liked Dos Equis, but its a shame that true Vienna lager is almost non existent these days. I decided to create a more traditional Vienna Lager, but with the ingredients I had on hand. Which means that it technically is not traditional. I decided to do a 50/50 split of pilsner and light munich malts. Now for some silly reason light munich is always quoted as 10L and I have no clue where this comes from. Read the malt analysis sheet of any malting co's light munich and you will get a range between 5L-8L. Compare that to a vienna malt's 3L-4L and you are right about have the lovibond. Where a traditional vienna was crafted out of mostly vienna malt I am testing the light munich and pils combo as an alternative. Unfortunately the awesomeness of the label doesn't carry through to the beer! Heated 2 gallons of montgomery county md strike water to ~175 and filled orange 3 gallon cooler with the 2 gal of tap water treated with 1.5 grams CaCl and campden. Flavor: moderate diacetyl butter, low perfumey ester, low floral hop, moderately low bitterness, low toasty malt. 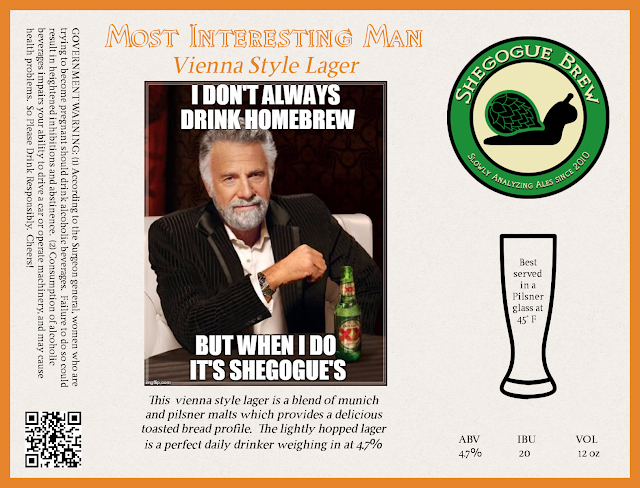 Mouthfeel: Moderate carbonation, medium body, moderately low slick feeling (diacetyl) low astringency, no creaminess. Overall: This beer is infected. No other way to put it. Its a shame cause it tasted pretty great flat before kegging. I would give this an overall score in the low 20s. I probably should have purchased fresh yeast for this one, or built up the starter slower. Although no diacetyl was detected at the time of kegging, as the beer lagered the buttery "goodness" was there. After investigating the cause, and looking back at how my beers have been degrading in the keg, I decided it was time to replace all my beer line and give my taps a thorough cleaning. 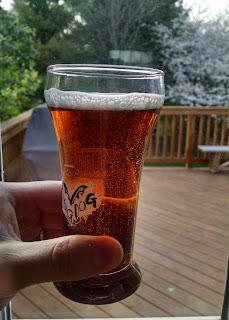 A lot of my beers have not been aging well after kegging - but taste fine prior. I am ashamed to admit I have not replaced my beer line in over 4 years and the worst damage probably occurred when I moved to the new house and left warm beer hangout in the lines. I did that last weekend and plan to document that as I learned a few tricks along the way.